Story by: Story and photos by SPC Charles Garelick - New York Guard. GARDEN CITY, NY On Saturday, 21 January 2017 members of the New York Guard’s 88th Brigade, 14th Battalion Commo Team conducted a MERNEX (Military Emergency Radio Network Exercise) to maintain and enhance their proficiency and readiness in MERN operations. The exercise concentrated on the Commo Team’s ability to install, operate and transmit voice messages and the primary exercise objective of passing digital messaging over HF radios from both a fixed station and deployed mobile stations in the field. Immediately after morning colors, a safety briefing and action plan of the exercise was conducted, individual duties were assigned to the team members and MERNEX operation begun. Two mobile stations of the 14th Battalion Commo Team were established in the parking field of the 1st Marine Corps District Base in Garden City, New York. The exercise at both mobile field stations was led by SFC Richard Martino, S6 Chief Signal NCO acting as instructor. Members of the 14th Battalion Commo Team operating the mobile field units included SSG Fantini, SGT Cruz, SPC Morelli, SPC Bilskii, SPC Hershenfeld and PFC Strack. After the installation and setup of the mobile units were completed, the operators immediately began to successfully establish voice communications with both the fixed and mobile stations. SITREPs were sent and received by all stations. The degree of reception from the participating stations varied from weak to loud and clear. Following the initial voice communications section of the exercise, the operators began passing digital transmissions with the participating stations. SITREPs via digital transmission were successfully established with all stations reporting in. The ability to pass and relay digital message traffic between stations, when previous voice communication proved to be intermittent, was successful and established the value of having a secondary High Frequency (HF) communication system available with operators fully knowledgeable in its use. After the successful MERNRX was completed, and all stations and equipment were stowed and prepared for future use, SFC Martino conducted a debriefing of the exercise with the Commo Team. They discussed and reviewed the exercise in preparation for future exercises and for readiness to deploy and operate the MERN mobile and fixed units for future New York Guard missions. The Military Emergency Radio Network (MERN) was established to provide the ability for New York Guard units to communicate effectively during disaster response and its assigned missions. The Military Auxiliary Radio System (MARS), which is a program operated jointly by the United States Army and United States Air Force with a mission objective to assist, and provide local, national and international communications in support of United States Military and the New York Guard, is staffed by volunteer civilian Amateur Radio Operators and active duty military personnel. MARS works hand-in-hand with MERNS to assist in maintaining a robust emergency communications network. To promote interoperability with MARS, the 88th Brigade also conducts operations out of the Air Force MARS MEOC-Mobile Emergency Operations Center. This unit can deploy to any location and has the ability to be set up and become operational in a short period of time to facilitate mission communications. The mobile MERN Units maintain two forms of power supply, a gas-powered generator and solar panels which provide dual electric systems. State-of-the art HF / VHF radio and computers and all equipment necessary to conduct field operations are also contained in the Air Force MARS MEOC. The proud “parent” of the Air Force MARS MEOC is the 88th Brigade’s own SFC Martino, who designed and maintains it. SFC Martino is also the Air Force MARS Region 2 Emergency Coordinator for both New York and New Jersey. 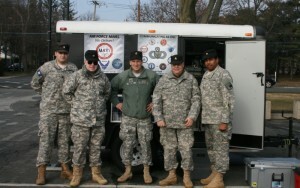 Additional stations participating in the 21 January MERNX included a fixed station at the Staten Island Armory, which was operated by 1LT Arbeeny, 88th Brigade HQ S6 Signal Officer and a mobile field station located in Rochester, which was operated by members of the 10th Brigade, New York Guard. Also participating in the exercise were three United States Air Force MARS mobile stations operated by members of the United States Air Force MARS, who were located in Oneida County, White Plains and Syracuse, New York. The operator of the station in Oneida County who participated in the MERNEX holds the position of National Air Force Emergency Coordinator.